NASHVILLE, Tenn. — West Precinct detectives are working to identify the woman believed to have stolen a purse from an unlocked car parked outside Franklin Road Academy at 4700 Franklin Pike on December 17. The victim left her purse in the vehicle when she went inside the school to pick up her children at 11:35 a.m. She did not immediately notice her purse was missing. The suspect was captured on video surveillance 45 minutes later using the victim’s personal information to obtain money from SunTrust Bank’s 2503 Lebanon Pike branch. 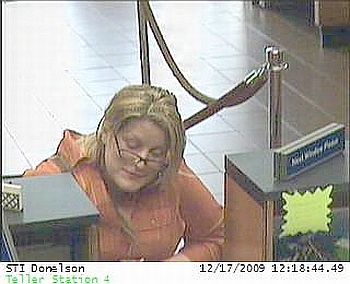 The suspect is a middle-aged white woman with long blonde hair and bangs. She is approximately 5’5” tall and weighs approximately 170 pounds. She wore an orange collared shirt and eyeglasses. Detectives are also investigating whether the suspect has committed similar crimes in the Middle Tennessee area. Anyone who recognizes the suspect is urged to contact West Precinct detectives at 862-7285 or Crime Stoppers at 74-CRIME. Citizens can also send an electronic tip to Crime Stoppers by texting the word “CASH” along with their message to 274637 (CRIMES) or online at http://www.nashvillecrimestoppers.com. Persons who contact Crime Stoppers by phone or text message can remain anonymous and qualify for a cash reward. City Live, From the Newsroom, Save the Planet! KNOXVILLE, Tenn. –El alcalde Bill Haslam anima a los residentes de la ciudad a reciclar sus guías telefónicas viejas. Los niños de las escuelas en la ciudad participan en una competencia por la escuela que recolecta más guias telefónicas desde ahora y hasta el 31 de enero de 2010. Las escuelas ganadoras recibirán incentivos en dinero en efectivo. El sistema de escuelas del condado Knox recolectó en el 2009 92 toneladas de material reciclable que según los experto en reciclaje salvó de ser cortados a 1,564 árboles, ahorró 276 barriles de petróleo crudo o 5,298 galones de gasolina. El impacto en el ambiente es en definitiva, profundo y esto llama a la atención de los residentes de la ciudad a participar nuevamente este año. City Live, From the Newsroom, Health, Knoxville is changing!! Bajo la administración del alcalde de Knoxville, Bill Haslam la compañía DSM Servicios Ambientales ha terminado un estudio de un año y lo ha presentado a los oficiales de la ciudad para su revisión. El Estudio se enfoca en la implementación de un sistema de recolección de basura reciclables a lo largo de una ruta en las aceras dentro de la ciudad. Al aplicar este modelo de recolección de basura reclicable se facilitará a los residentes de la ciudad que voluntariamente participan. Según el modelo presentado se colocarían recolectores de 95 galones en puntos claves de la ciudad y se recogerían cada dos meses. Los participantes no necesitarán separar la basura reciclable. Al momento se estudian los aspectos financieros teniendo en cuenta fondos federales y los $150,000 a $200,000 que resultan de la venta annual de material reciclable. Se estima que de los 59,000 hogares que participan en el programa regular de recolección de basura semanal, unos 20,000 hogares serían los vuntarios a ser parte del posible nuevo programa de reciclaje de la ciudad. From the Newsroom, Save the Planet! Purchase, NY – Amid mounting agreement that future clean, “carbon-neutral”, energy will rely on efficient conversion of the sun’s light energy into fuels and electric power, http://www.ethanol-bio-fuel.com group of researchers is focusing on one of the most ancient groups of organism, the cyanobacteria. Dramatic progress has been made over the last decade understanding the fundamental reaction of photosynthesis that evolved in cyanobacteria 3.7 billion years ago, which for the first time used water molecules as a source of electrons to transport energy derived from sunlight, while converting carbon dioxide into oxygen. The light harvesting systems gave the bacteria their blue (“cyano”) color, and paved the way for plants to evolve by “kidnapping” bacteria to provide their photosynthetic engines, and for animals by liberating oxygen for them to breathe, by splitting water molecules. For humans now there is the tantalizing possibility of tweaking the photosynthetic reactions of cyanobacteria to produce fuels we want such as hydrogen, alcohols or even hydrocarbons, rather than carbohydrates. Progress at the research level has been rapid, boosting prospects of harnessing photosynthesis not just for energy but also for manufacturing valuable compounds for the chemical and biotechnology industries. Such research is running on three tracks, one aimed at genetically engineering real plants and cyanobacteria to yield the products we want, the other to mimic their processes in artificial photosynthetic systems built with human-made components and the third to develop a Super Enzyme, which will increase the energy efficiency of current ethanol production processes. Linus Torvalds is best known for having initiated the development of the LINUX operating system. His project is a great success. Let’s do the same with the efficient conversion of the sun’s light energy into fuels and electric power! There is a possibility of tweaking the photosynthetic reactions to produce fuels we want such as hydrogen, alcohols or even hydrocarbons, rather than carbohydrates, as the photosynthetic reactions produce. Scientists and Engineers! Let’s join our creative powers. Let’s accomplish this jointly by collaborating, all together, at the http://www.ethanol-bio-fuel.com portal. Evidence of Tennessee’s rich history — pictures of schoolchildren from the Depression, police notes on the 1968 assassination of the Rev. Martin Luther King Jr., sheet music poking fun at the teaching of evolution from the time of the 1925 Scopes monkey trial, and documents from Civil War battles — have been gathered together for the first time in a digital museum called Volunteer Voices (www.volunteervoices.org). Public school teachers and students to advanced scholars and researchers now have access to nearly 11,000 documents and images that were assembled with the help of a three-year, $928,000 grant from the U.S. Institute of Museum and Library Services (IMLS) and matching support from 10 partner libraries, historical societies, and museums in the state. Pequeños cortes de gastos suman cantidades significativas de ahorro. KNOXVILLE, Tenn.— Los consumidores están gastando más que nunca antes en sus compras en el mercado, según los expertos en presupuesto familiar del Consumer Credit Counseling Service (CCCS) del Este de Tennessee. Los expertos señalan que en promedio las familias gastaron $356 en enero 2009, comparado con $316 en enero 2008-un aumento del 12%. “En una economía difícil como la de hoy, la reducción de los gastos en cualquier área puede ser de gran ayuda para el presupuesto familiar“, dice Daru Burdge, presidente de CCCS. “La reducción del gasto semanal de alimentos en sólo $ 25 agrega $ 100 al mes que se pueden utilizar para pagar deudas o añadir a una cuenta de ahorros”. CCCS sugiere que los consumidores tomen nota de los gastos actuales y que se fijen en las oportunidades de reducir dichos gastos. Mirando los recibos de sus compras pueden identificar gastos en compras impulsivas o en golocinas que quizas no se necesitaban. Con tan solo cortar esos gastos se puede acumular cantidades significativas en ahorros. Haga una lista de lo que va a comprar y solo compre eso. Planee sus menús para una o dos semanas. Al tener una lista será más fácil hacer compras inecesarias. Use los cupones de descuento y aumente sus ahorros. Revise la alacena antes de ir de compras para evitar comprar un producto que ya tiene. Aproveche los ahorros al usar cupones, las ofertas especiales y las promociones de compre dos por el precio de uno. Además de los periódicos del domingo y los supermercados se pueden conseguir cupones visitando http://www.couponmom.com para luego comparar los precios en el mercado. Si encuentra un producto en oferta cerciórese de la fecha de expiración del mismo. Solo compre los productos en oferta que Ud. normalmente compra. A veces resulta más económico comprar 3 docenas de huevos pero Ud. termina tirarndo una docena a la basura porque pasó la fecha de expericaión y no tuvo tiempo de comerlos antes. Considere la compra en paquetes grandes compartidos con amigos o familiares para compartir el costo. Otros consejos para evitar las compras innecesarias e impulsivas incluyen el comer antes de ir de compras. Revise los estantes más bajos y los más altos en los que puede hallar productos de mucho más bajos precios. No asuma que los productos son más económicos porque contienen más o vienen en cajas grandes. Use una calculadora para determinar el costo de una libra del producto y comparelo con otras marcas y tamaños. Ahorre en los almuerzos al llevar su almuerzo preparado en casa. Usando esta alternativa puede ayudarle a ahorrar bastante al final del mes en lugar de comprar cada día su almuerzo de comida rápida. Si necesita ayuda en la preparación de su presupuesto familiar busque los servicios de CCC en 1-800-251-CCCS. NASHVILLE, Tenn.– Music City is no more that one where people use to leave doors unlocked or purses misplaced while nobody would mind it. A review of stolen vehicle reports in Nashville from Sunday, December 13, through Saturday, December 19, shows that 37.5% of the automobiles taken (nine out of 24) were easy targets because the keys were left inside or were made available to thieves. The police department’s PARK SMART campaign strongly urges citizens to lock their automobile doors, secure any valuables and REMOVE THE KEYS. Officers also urge citizens to SHOP SMART by not leaving purses or other valuables unattended in shopping carts, even for a very short time. An unattended purse is an easy target for a thief. People wishing for those ‘better days of the past’ might enjoy rather staying home watching old-time movies.